A lead page is a single web page that a user is directed to in response to clicking an online advertisement. The lead page will display directed sales copy that is a logical extension of the advertisement which they have clicked. The reason lead pages are used with digital marketing is because they have a far higher conversion rate then directing marketing traffic to the home page of a website. Most businesses generally rely on a sales funnel to attract more customers. For example a business may offer a free consultation, trial or quote to entice customers into using their services. If this is the case for your business it is essential to have lead pages on your website to direct online marketing traffic to. When marketing traffic is directed to landing page the marketing campaign has a much higher conversion rate then when it is directed to the home page of the website. As the name suggests, click through landing pages have the objective of encouraging the visitor to click through to another page. Typically click through landing pages are used in online stores because they describe a product in sufficient detail to convince a potential customer to make a purchasing decision. A common mistake is directing inbound advertising traffic to a shopping cart or registration pages. This results in poor conversions as the ad doesn’t provide sufficient information for someone to make an informed purchasing decision. This is where the click through landing pages come in. 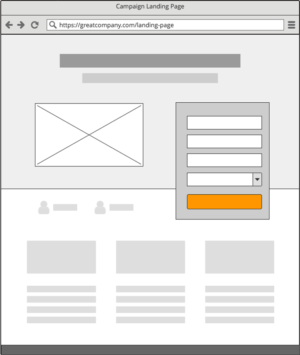 As a result, the ‘end point’ from a click through landing page is typically the shopping cart or registration page. This results with an increased chance of conversion having passed through the details of the landing page.